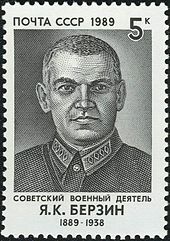 Soviet admiral* Mikhail Viktorov fell in the purges on this date in 1938. 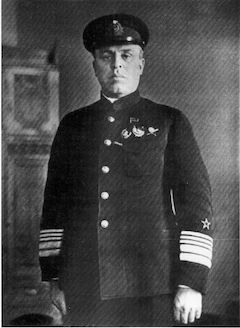 A young officer fresh from the Naval Academy when World War I broke out, Viktorov (English Wikipedia entry | Russian) made a timely switch to the Bolshevik side during the Civil War and scaled the heights of the Soviet navy. 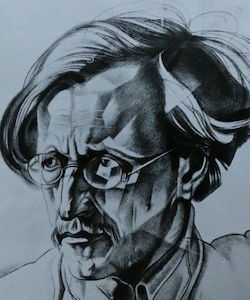 The same fate awaited Viktorov, a perilous occupational hazard in those days. He was rehabilitated posthumously in 1956. 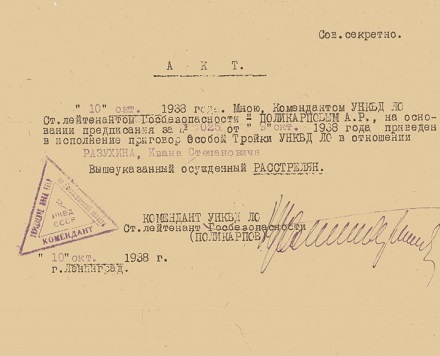 * Viktorov’s rank was “Fleet’s Flag Officer, First Rank”; in 1938, this was the equivalent of admiral, and after a 1940 reorganization it was replaced full stop with admiral. 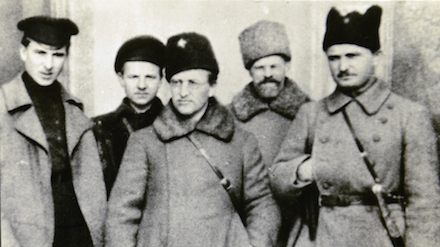 ** It appears to me that fully seven consecutive heads of the Soviet Navy eventually ended up executed in the 1930s and 1940s (not all of them directly deposed from running the navy). Pantserzhanskiy, Zof, Muklevich, Orlov, our man Viktorov, and also his successors Smirnov and Frinovsky. A major trading city that had been forced open to western concessions by the Second Opium War, Wuhan had become, briefly, the capital of the Chinese Kuomintang after Japan’s initial onslaught the previous year quickly captured the former capital Nanking. * The linked newspaper miscopied the dateline; it should read “Hankow, Oct. 27” rather than “Oct. 2”. The Third Reich on this date in 1938 guillotined two civilians as French spies. 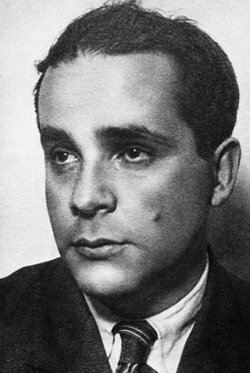 Seventy-one-year-old merchant Ludwig Maringer had sent French intelligence notes on German industrial production and armaments factories from Berlin. 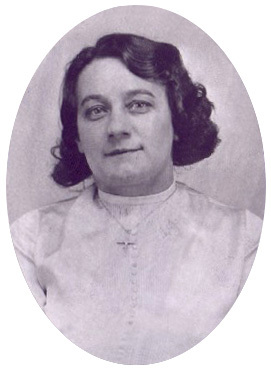 Thirty-nine-year-old Marie Catherine Kneup had turned mole from the advantageous position of domestic in the household of a German spy. The latter case specifically — both the execution of Marie Catherine and the prison sentence given her husband Albert — is the subject of the German-language novel Spatzenkirschen. 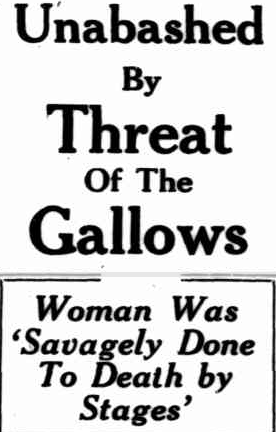 On this date in 1938, serial poisoner Anna Marie Hahn was electrocuted in Ohio. The Bavarian-born immigrant had arrived to Cincinnati espoused to a young telegraph operator. Hahn herself tried her hand at a bakery but soon tired of the tedium of honest work and set herself up better in the lucrative business of elder abuse. Using an ancient ploy still effective to this day, the “plump and pretty” young woman flitted about the German emigre circles of Cincinnati advertising herself as a live-in caretaker for senior citizens. Once retained, she was in a position to price-gouge for her “services”, pilfer from the estate, and even to so insiniuate herself into her clients’ good graces as to enter their wills. Her first victim, Ernest Kohler, actually left her a boarding house: pretty good work compared to rolling out dough before the sun came up. Good-bye all of you and God bless you … Mr. Woodard [the warden], don’t do this to me. Think of my boy. Can’t you think of my baby? Isn’t there anybody who will help me? Is nobody going to help me? * One clever fellow, George Heiss, escaped her clutches when he grew suspicious of a mug of beer she presented him; when Hahn refused to sample it herself, he sacked her — but he did not report her. 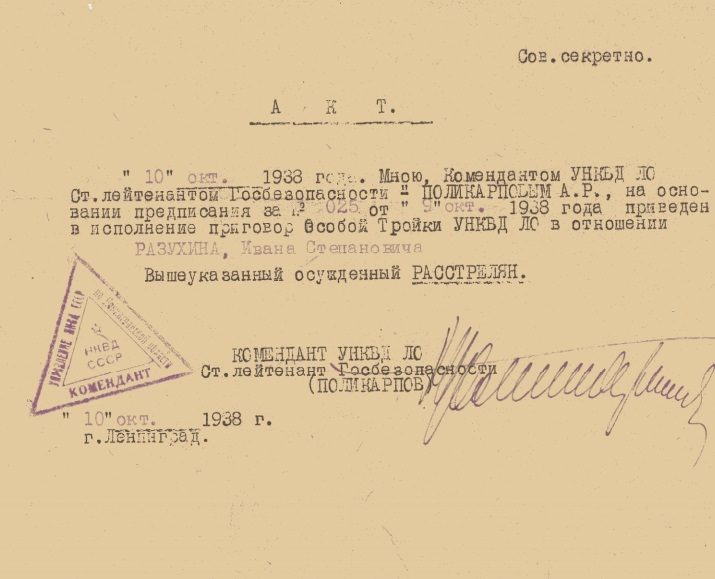 Soviet NKVD execution form records that Ivan Stepanovich Razukhin was shot by Lt. A.R. Polikarpov on October 9, 1938. From Zek: The Soviet Slave-Labor Empire and Its Successors, 1917-2000. The headline story from Wimbledon in July of 1938 ought to have been the conquest of its renowned tennis championship by Don Budge. The American great didn’t drop a set in seven rounds romping to a men’s title that left him on the cusp of sweeping the Grand Slam tourneys that year. Weeks later, Budge did indeed complete the Slam by taking the U.S. Open — the first player to accomplish that feat in a single year. But on the morning of July 14, two weeks after Budge raised the silverware, Somerset Road opposite Centre Court yielded up to a passing motorist the body of a 30-year-old woman. The badly mangled body suggested a hit-and-run, but examination soon revealed that Rose Muriel Atkins had come to her grievous end via the trauma of a small, sharp instrument and not a large, blunt one: the tire marks over Irish Rose’s legs merely a post-mortem red herring. By no coincidence, a local driver that morning skipped his shift and disappeared, leaving his van in a buddy’s garage. Once police caught wind of this circumstance and found in the van extensive bloodstains that the fugitive deliveryman had unsuccessfully scrubbed, the nationwide manhunt for George Brain was on. Brain managed to stay on the lam for more than a week, which caused him to miss his intended July 21 wedding date, but this futile flight was really the strongest defense he could offer. The old “blacked out during this person’s inexplicable murder” defense. Too bad for that story that he actually killed her with a knife; the judge incredulously instructed the jury that “one who takes a chisel or a knife, such as has been produced — a cobbler’s knife — and tears up the throat of a woman, cannot be heard to say that he never expected her to die and never intended to kill her.” Though Brain meted out the wounds with (per the coroner’s characterization) “savage determination” he had still not gone so ravingly feral that he couldn’t be arsed to stage the hit and run or rummage the moll’s purse for her last four shillings. The jury needed only 15 minutes to convict. Brain’s convivial reputation around Wimbledon earned him 16,500 subscribers to a petition to save his neck despite what he’d done to Atkins’s, but the Home Secretary turned him down flat. Brain was executed at Wandsworth Prison by Thomas Pierrepoint.